When you’re really passionate about wine, there’s nothing better than getting an opportunity to visit one of your favorite wineries, meet the winemaker, and then have a blending session led by that winemaker. By learning the basics of blending, you can taste how just a few drops here or a few milliliters there of Cabernet Franc added to a Cabernet Sauvignon Merlot blend can make all the difference, one creating a blend that you don’t like at all to one that is sublime, one that you can’t wait to drink. The same principle applies in perfume blending, as I learned one recent Saturday in Los Angeles. I had met perfumer Sarah Horowitz through the Artisan Frangrance Salons held in San Francisco and LA, and I liked her perfumes very much. I’m obsessed with Perfect Coconut Milk and Beauty Comes from Within. When I heard that she also teaches a beginner’s class in the art of perfumery I signed up immediately. The class takes place at Sarah Horowitz Parfums, Sarah’s atelier where she has all of her raw materials – essential oils, extracts and more, on display, a beautiful array of colored bottles on mirrored shelves. The space is cozy and inviting. Joining me were six other students, four women and two men. We were brought together by our love of perfume and desire to learn more. Sarah asked each of us to talk about our early perfume memories, which we all had. It’s interesting to see how strong a connection we all had with specific scents – fragrances from home surroundings, worn by family members, or specific places traveled to. Here we were beginning our scented journey. “Perfume is one of the highest gifts you can give,” says Sarah. The word perfume is from the Latin per fumum, which means through smoke. “It is also one of the oldest art forms.” Sarah has been creating fragrances for over 20 years. She also blends bespoke, or custom perfumes for clients. And Sarah offers “The Fragrance Journey,” where she helps individuals find a very special scent for themselves. Our class starts with a history of perfume, and the basic structure of a fragrance. It is more than just the top, middle and base notes; the proportion of each used will change the nature of the perfume, even as much as one drop. 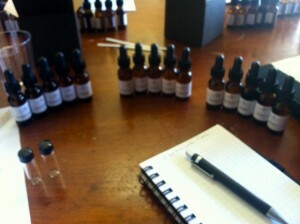 We learn about structuring a fragrance by building a pyramid and layering notes into accords. Top notes are typically citrus and other fruits, middle notes are flowers and base notes are resins and woods, like sandalwood and amber. 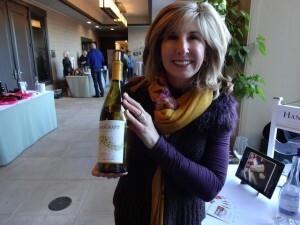 As she talks, This makes sense to me, as in wine, the initial aromatics are all fruit, then floral notes develop. 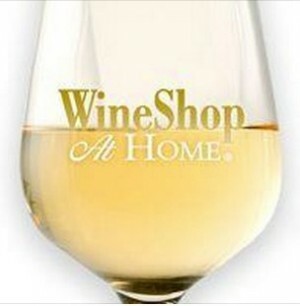 The finish of a wine showcases vanilla, oak or caramel notes. Each of us has a brown gift box with a bow around it sitting in front of us. Sarah repeats that perfume is a gift and that we’ve given ourselves this gift of creating a fragrance. Inside, 15 small brown bottles with eye dropper tops. There are five top, five middle and five base notes. This is our blending kit. The rest of the day we’ll spend creating three blends. Sarah’s first assignment is to create a perfume that reminds us of a certain place in time. First we write a “brief,” or the story of the perfume. I do my best to recreate aromas I smelled on a trip to the San Juan Islands. For this blend, I go heavy on the base notes, with cypress, sandalwood and cedar, with a little blood orange and floral notes. While I didn’t achieve my goal, my “Friday Harbor” scent gets good reviews. We all try each others blends out – and it is amazing to see how different they are, even though we all had the same notes to work with. Sarah gives us our next brief as a list of words: fall, leaves turn color, crisp fresh air, sunset, boots, jeans. I created “Falling Leaves” but I’m not too excited about it. Again, all of our blends are so different even though we had the same brief to work from. For the last blend, the brief is short: we have to use honeysuckle as a note. This time I create what I think is a decadent and exotic scent, based around tuberose, my favorite favorite flower in all of perfumery. This perfume is it! I absolutely love it. I’m not going to give details…perhaps one day I’ll make it into a commercial perfume. As with a wine blending session, where you get to take home a bottle of your own blend, we perfumery students get to take home small vials of our newly blended fragrances and the 15 notes in our kits. Sarah encourages us to experiment and to not be afraid to mess up and start again. Since taking the class, I’ve shopped my perfumes around with my friends. It’s interesting to see what they like. I’m not surprised they like the tuberose scent, but didn’t expect them to like Friday Harbor as much as they do. I can’t wait for the next class.